Regina has been awarded the 2010 Bantam Selects. It will be held at Lions Park from August 6-8. Sask Baseball is pleased to announce that Kindersley will host the 2010 Baseball Canada Cup for the second year in a row. Attention Sask Baseball Members – Team Saskatchewan is currently accepting applications for the following positions with our high performance programs. 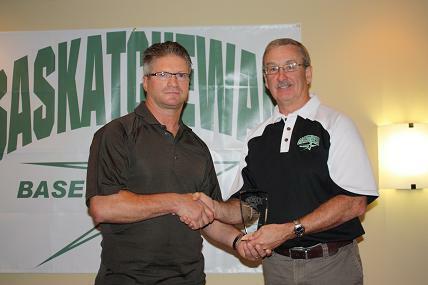 We are pleased to present the recipients of the 2009 Sask Baseball Annual Awards. These awards were presented during our Annual Awards Luncheon at the Regina Inn on Saturday, October 17th. Tanner Spencer (Craik, SK) was the starter for Team Grey. He allowed an unearned run on two hits with one strikeout in two innings of work. Iannick Remillard (Valleyfield, QC) threw a scoreless inning for Team Grey, allowing one hit and a walk while fanning one. Are you interested in receiving individual lessons on a one-on-one basis with Sask Baseball High Performance Director Greg Brons?